Goat cheese is one of those things that I like but just have never bought. It has a pretty unique taste, tangy might be the word you can use to describe it. It’s a soft cheese, and can be easily spread. When you buy it, it comes in a log shape, I used about half of that log for this meal (5 chicken breasts). You probably won’t find it in the dairy section, but most likely near your deli in the specialty cheese case. I bought mine at Costco, with my new membership that I am very excited about! 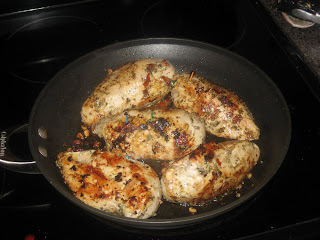 I saw an Everyday Food show on TV a few weeks ago (it airs on PBS), and they stuffed some chicken breasts with sundried tomatoes and herbs then a piece of Fontina cheese. I’ve been craving something similar since I saw it and thought I would try goat cheese instead. I didn’t really follow a recipe for this meal, just used the same “stuffing” technique I saw during that show. 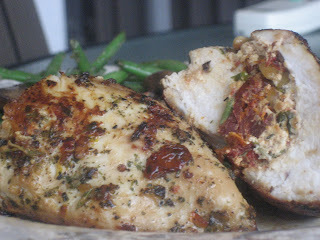 It’s pretty easy and very versatile, you can stuff a chicken breast with almost anything! With a paring or smaller knife cut a small slit into the chicken breast. Without making the slit bigger, work the knife on the inside of the breast to make a pocket for the stuffing. Be careful not to cut through the chicken. Fill the pocket with whatever your stuffing combination you like then carefully close the hole with a toothpick. For my “stuffing” I decided to use the goat cheese, plus julienned sun dried tomatoes in olive oil (another Costco purchase, big jar so I will be using sun dried tomatoes alot! ), fresh herbs from the garden – oregano, parsley, thyme – and toasted pine nuts. If you don’t have any fresh herbs you can always use dried Italian herbs. In a bowl, I crumbled the goat cheese, then added the herbs, sundried tomatoes in oil, then the pine nuts, a little salt and freshly ground pepper. With my hands (you can use a spoon, but I like using my hands) I mixed everything till it was all combined. I then scooped up the cheese mixture, and with my hands again stuffed it into each pocket in the chicken. Close up your holes with toothpicks so it doesn’t come out during the cooking process. Once you are done stuffing, mix salt, pepper, dried Italian herbs and garlic powder with olive oil and rub all over chicken. I actually used a seasoning that I purchased from the farmer’s market last weekend from an Italian deli in Lake Mary (Mama Lou’s), it was made of dried tomatoes, garlic, onion and Italian herbs. If you live in the area, I highly recommend going by their store and picking some up. The spice mix is “dehydrated” so you add 2 tablespoons of it to a little warm water and let it sit, then mix it with olive oil. You can add it to dips, marinades, basically anything! It’s got great flavor and it really made this chicken even better. To cook the chicken, heat up a large nonstick skillet (oven safe if you have it, if not you will just have to transfer chicken to a baking dish) over medium-high heat. Add a few tablespoons olive oil to the skillet and spread around. Add chicken. Brown each chicken breast, approximately 4-5 minutes on each side. Once chicken is browned, place in heated oven, 400 degrees to finish cooking for about another 15-20 minutes. Take chicken out of skillet to let rest for about 5 minutes. In the meantime, place skillet (don’t forget to use your oven mitt!!! the handle is hot from the oven…) back on burner and add about 1 cup of white wine to the pan drippings – if using a baking dish pour drippings back into original skillet for more flavor. Cook wine until it reduces and gets a bit thicker. Spoon over chicken and enjoy!! This is one of those meals that is more technique than recipe. If you can learn this, there are so many different meals you can create. I served the chicken with green beans and sliced baby portabella mushrooms sauteed in olive oil and also a chopped tomato salad dressed in balsamic vinegar, salt and pepper. Goat cheese is my absolute favorite cheese ever! Hubz and I were just discussing last night that we must always have some in the fridge! Jenn – I love it too! I have some leftover so I am going to have to think of something yummy to make with it! I was thinking of topping some pizza with it…it may become more of a staple in my fridge now.